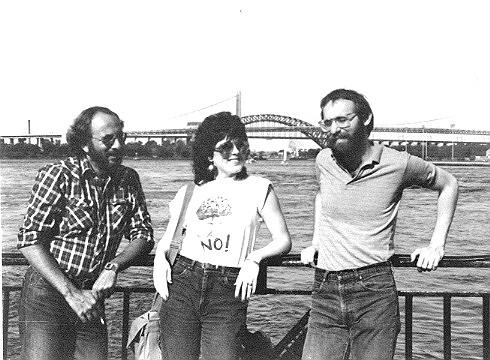 UPI staffers Jim Pecora, Dana Walker and Rand Morrison, taking in some of the sights in New York in 1982. CHICAGO, Sept. 19 (UPI) -- Jim Pecora, who helped train a generation of news writers as a national broadcast editor at United Press International, has died of cancer at age 62. Pecora, who exemplified the best attributes of the wire service journalist with fast, accurate, punchy copy and deft editing, died Friday after a six-month battle with lung cancer. A long-suffering Chicago White Sox fan, Pecora earned the respect of everyone he worked with for his professionalism and gregarious spirit regaling co-workers with endless observations on everything from food, philosophy and politics to his beloved and often-beleaguered South Side ball club. "He was able to get the best out of you and your work," said Steve Huntley, editorial page editor of the Chicago Sun-Times who worked at UPI National Broadcast. "He was an incredible mentor to young people in the business." A graduate of the University of Illinois, Pecora left UPI in 1994 and became business editor at the Star, a suburban newspaper chain. "Jim was a principled person. Anything Jim said he believed, and he believed deeply," said retired UPI Managing Editor Billy G. Ferguson. Pecora is survived by his wife, Penny, two children, two stepchildren and two grandchildren. Jim Pecora, the business editor of the Star, was a career newspaperman who fit almost all of the traditional stereotypes of his profession. Mr. Pecora, who died Friday of lung cancer at age 62, was a round, gregarious man who loved to eat. He rarely wore a jacket to complement his loose-fitting tie. And he regaled his co-workers with stories while working long hours. Mr. Pecora, a longtime Park Forest resident who last lived in Homewood, was a former United Press International staffer who came to the Star in 1994 after the demise of the wire service. He began as a part-time writer for the Tinley Park newspaper's business section, and at one time edited some editions of the paper. He became business editor in 1997. "Jim's passing is a sad event for those of us who knew and worked with him," said Franklin R. Shuftan, editor of the Star. "Jim was a veteran newspaper guy who got the journalism bug as a young man and never let it go. He knew a story when he saw one, and he knew how to pursue and write it. "On a personal level, Jim was someone who had an opinion on almost everything, from 'The Sopranos' to George W. Bush to the quality of capicola on the sub sandwiches he loved to eat." Former UPI co-workers remembered him as a friend and colleague. "He was able to get the best out of you and your work," said Steve Huntley, who worked as a news writer and then editor with Mr. Pecora in UPI's broadcast department in Chicago in the 1970s. "He was an incredible mentor to young people in the business." Huntley, who is now editorial page editor at the Sun-Times, and Mr. Pecora worked under Billy Ferguson, who retired as UPI's managing editor in 1990, and was instrumental in bringing Mr. Pecora from the wire service's Indianapolis bureau to Chicago. "Jim Pecora was one of the finest men I have ever known, without a doubt," Ferguson said. "He was a good newsman. He was a wonderful friend. "Jim was a principled person. Anything Jim said he believed, and he believed totally." Mr. Pecora's influence on the Star newsroom is evident whenever someone speaks of him. "I couldn't have asked for anyone better than Jim to teach me the ropes about the news business," said business writer John K. Ryan. "I'll always think of Jim as someone who enjoyed life to the fullest, especially when it came to eating. He would relish a meal -- especially if it were a spicy one -- in a way that made me think I had never really enjoyed one myself. "His zest for life was inspiring, and I'll miss him." Mr. Pecora was a rabid White Sox fan who often burst into loud, impassioned monologues about his years of frustration with the South Side team. Mr. Pecora was born Sept. 22, 1942, grew up in Franklin Park and attended elementary and high schools in the west suburbs. He earned his bachelor's degree from the University of Illinois at Urbana-Champaign. He is survived by his wife, Penny Will; son, Jay; daughter, Sarah; stepson, Tristen Purpura; stepdaughter, Rachel Purpura; and two granddaughters.